For some applications, an air compressor is essential. For spray painting or air brushing, you can’t do without one. There are other instances where an air compressor can be an advantage. Pneumatic tools are often the best for a number of reasons, I’ll get into the details later. Since air compressors range from small portable units to large industrial machines, a big question is what size air compressor do you need? Prices vary greatly, depending on the size and type of air compressor that you’ll be using. So it’s important to get your facts right before you go out and spend your hard earned cash on just any air compressor. Along with asking myself what size air compressor I need, there are other factors to consider too. There’s the issue of power source, perhaps noise levels, and portability. This article is going to guide you through the process of deciding what size, and type of air compressor will meet your specific needs. Asking what size air compressor do I need is not as simple as it may seem. There’s the size of the motor, or horse power. This is a good starting point. However, the size of the air compressor tank can be just as important. It will depend very much on how you intend using your air compressor. The size of the actual compressor, that pumps the air, is probably the most complicated because there are different types of air compressors. There’s a lot to understanding air compressors, and I’d like to approach the topic in a logical, step by step manner. So before calculating the size of the air compressor that you need, it’s a good idea to understand how they work. How important is Psi and CFM? Because air compressor applications vary so greatly, there is no one size fits all answer. A portable air compressor, without a tank is only suitable for pumping tires, air brushes and low volume nail guns, or perhaps some other tools that don’t require a high volume of compressed air. There are larger air compressors that are also portable, that can do more. Then there are large, permanently (or semi-permanently) installed air compressors for a workshop. So a DIY shop, contractor, or industrial shop, will all require a different size, and possibly a different type of air compressor. In order to determine your needs, let’s start by looking at how an air compressor works. VIDEO | What Size Air Compressor Do I Need? There are several types of air compressor, but they all work on one basic principle. Mechanical power, from a gas engine or electric motor, is used to pump air into a tank or directly to a pressurized outlet. There are two ways that air is pumped by the air compressor. The most common of these are reciprocating air compressors. Most of the air compressors on the market are reciprocating, so I’ll be discussing these in more detail. The other type is a rotary screw air compressor. ✓ Learn more by reading our article : How does an air compressor work? Most air compressors use a reciprocating piston to compress the air inside a cylinder. They basically push the air like a plunger. Air compressors can use one or two pistons, using a single stage or two stage action. A single stage air compressor usually has one piston to pump the air and will generally reach a maximum pressure of 120 – 150 Psi. They may use two pistons to achieve this, but still use only a single stage action. By using two pistons, a single stage air compressor can be more efficient and compress more air with each stroke. But this is not necessarily case. A larger, single piston can work just as well. A two-stage air compressor will always use two pistons. These machines use one piston for the first stage, compressing the air to around 150 Psi. The second piston is for a second stage of compression, taking the pressure up to about 200 Psi. It’s important to distinguish between a two stage air compressor and a single stage, two piston, air compressor. A single stage air compressor can use two pistons in tandem to increase the amount of air that it compresses. So it increases the Cubic Feet per Minute (CFM). I’ll discuss CFM and pressure later. A two piston compressor that works in two stages, uses the pistons in succession. The second piston pressurizes the air that has already been pressurized once during the first stage, increasing the Psi. So single stage, two piston, air compressors increase the volume (CFM), whereas two stage air compressors use two pistons to increase the pressure (Psi). The type of air compressor that you choose will affect both the physical size of the machine and its capabilities. Since we’re looking at only reciprocating air compressors, I’ll be discussing the types of reciprocating air compressors available to you. There are two types of portable air compressors, direct air compressors (with no tank) and portable air compressors with a tank. The first type is the smallest, lightest and, therefore, the most portable. Portable air compressors with no tank are generally used by hobbyists and for light-duty DIY work. Though they can be useful for contractors who want to do quick jobs, using a light-duty nail gun or a similar pneumatic tool. An air compressor without a tank has to supply the correct pressure (Psi) and volume (CFM) for the tool that it is used to power. This means that you can usually use only one tool at a time. The smallest of these will only supply enough air for an air brush, or to pump the tires of a car. Larger models will supply enough volume to run a nail gun. High-power pneumatic tools and spray painting guns will not work, unless the air compressor has a tank. Portable air compressors with a tank are very popular amongst contractors and DIY enthusiasts. They can be used for many tasks that can compare to large built-in air compressors, just on a smaller scale. Because they are compact and relatively lightweight, they can be moved around and won’t take up much space in a home shop or garage. The size and power of portable air compressors can range from enough to supply a single nail gun up to several pneumatic tools, and even a spray gun. The higher capacity portable air compressors are obviously larger, heavier machines. So their portability is not as easy, you’ll probably be wheeling it about more than carrying it. These air compressors are usually permanently installed and are seldom moved. They may also be mounted to trailer for large building projects, like roads. Generally, these air compressors are used in commercial shops and commercial spray booths. A more industrious home shop may also use a larger built-in air compressor. These machines also vary greatly in size, but they can all handle multiple pneumatic tools and machinery that require greater air volume. Because large air compressors are more powerful, they will usually require a 240V (or higher) electric supply. 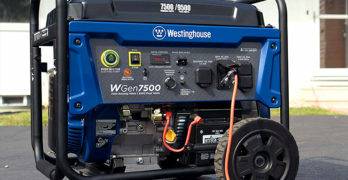 Some will use a gas engine, particularly for construction work where there might not be a suitable electric supply. Most air compressors are installed outdoors, because they can be excessively noisy. In a home shop, or on some jobsites, the air compressor may have to be placed in the same room as the people using the tools. In these instances, a quiet air compressor will help a lot. While not completely quiet, these air compressors usually won’t interfere with a speaking voice. They tend to be more expensive and will be limited in size. Really large air compressors can never be too quiet. However, quiet air compressors can be large enough to supply a full jobsite with a number of pneumatic tools being used at the same time. When determining what size air compressor you need, the pressure and air volume is likely to be your most important consideration. Air pressure is measured using Pounds per Square Inch (PSI) or Kilopascals (KPA). The standard unit of measurement in the US is Psi. The amount of air, or volume, is measured using Cubic Feet per Minute (CFM). These two units combined, will affect what tools you can use and how many can be used at the same time. All pneumatic tools and machinery have a rated pressure at which they will perform optimally. Generally, we use pneumatic tools and spray guns at two pressure ratings – low pressure (40 Psi) and high pressure (90 Psi). This will be used in conjunction with the air volume. For example, a High Volume Low Pressure (HVLP) tool, like a most spray guns will generally use a pressure of 40 Psi or less, but will require a relatively high volume 3 – 6 CFM. All tools and air machinery will be rated in this manner, by the following criteria. If you look at air compressor size specifications, they will normally indicate Horse Power (HP), Max. Psi, and CFM. Horse power is the size of the motor or engine and will generally be relative to the Psi and CFM specs. The Max Psi spec is the maximum pressure to which the air can be compressed and will usually be 100 Psi or more. The CFM spec is the rate at which the air is compressed into the tank. This is the amount of air being pumped per minute. The CFM rate affects the air recovery rate. In other words, once the tank pressure has dropped below the required Psi, a greater CFM rate will mean a shorter time to regain this pressure. The final part of the puzzle is the tank size. This can make all the difference. So the size air compressor that you need is a combination of pressure, CFM, and tank size (measured in gallons). A large tank can compensate for a lower CFM rate because it holds more pressurized air. Let’s say your tool uses 5 CFM, but your air compressor only supplies 3 CFM and your maximum pressure is 120 Psi. When your tank reaches max Psi, the air compressor switches off. It will use the air in the tank up to a certain point, usually higher than 90 Psi. Once it reaches the low pressure threshold, the air compressor will switch on again. So, if you have a larger tank, you can use more air before it reaches the low pressure mark. Since your tool is using more air than the compressor produces (5CFM out; 3 CFM in), your tank will continue to lose pressure as the compressor runs. There is 5 CFM leaving the tank and this is only being replaced at a rate of 3 CFM. Pretty quickly, the tank pressure will drop below the required 90 Psi and you will have to stop working while the pressure recovers. If your tank holds a large volume of air, it will take longer for the pressure to drop below the minimum requirement. You will be able to work for longer before the tank needs to recover. But you will still need to wait for the recovery time once the pressure drops too low. Ideally, you want a compressor that will keep working indefinitely to reduce downtime. A larger tank, or using several tanks, is a reasonable compromise, but is not ideal. In a DIY shop, this might be okay. But in a commercial shop, where time is money, a higher CFM rate will increase productivity. So before calculating what size air compressor you need, keep in mind that your tank can act as a buffer between low volume or pressure and your actual requirements. A higher tank pressure will also help, because it will take longer to go from a high maximum pressure to a low pressure, recovery point. Pressure (Psi) is of some importance but not critical, unless you’re using high pressure equipment that requires more than the usual 100 – 150 Psi for single stage air compressors. Volume (CFM) is probably the most important, because this determines how much air the compressor can supply to your tools and machinery. Tank size (gallons) will help you work for longer if your air compressor does not meet your required CFM rate. It’s likely that you’ll be using a variety of pneumatic tools with different Psi and CFM ratings. So it might not be a simple matter of adding together all the CFM specs for the tools that you intend using. The CFM rating for an air compressor will also be affected by humidity and temperature. For this reason, it’s best to use Standard Cubic Feet per Minute (SCFM) as a yardstick. This is the best way of ascertaining the actual capability of an air compressor relative to your needs. It is calculated as follows: 14.5 PSIA at 68°F and 0% relative humidity. You won’t be able to accurately determine the temperature and humidity at any given time. So it’s best to add 30% to the calculated CFM needs as a safety margin. Once you’ve added all the pneumatic tools that you may be using simultaneously (+30%), you’ll have the ideal SCFM requirement for the compressor that you need. You might find that the size compressor that you need is way more than you expected. Do you have space for the size compressor that you need? Do you have the required electrical supply (voltage and amperage)? Remember the tank discussion? This could make all the difference. What size compressor tank do you need? If your SCFM rate for your compressor is higher than your total requirement, you need not worry too much about the tank size. Your compressor will always be able to recover before the pressure drops below the minimum spec for your tools. Though this is seldom the case and we can’t always determine, with exact certainty, which tools will be used at the same time. Choosing a larger tank can easily compensate for these differences. As you use your tools, your CFM requirement will fluctuate and a larger tank can make a big difference by keeping that much needed reserve supply of compressed air. The good news is that you can always link up additional tanks. This is easy enough to do. You just need a Tee-coupler and a pipe to add another tank. You can use as many additional tanks as you need and this can be done at any time. So, while it’s a good idea to buy a compressor with a large tank, you can upgrade as your needs change, without replacing your compressor.